Tastemakers Just How Disruptive Are The World Restaurant Awards Really? Just How Disruptive Are The World Restaurant Awards Really? It was like a who’s who of the culinary world. At the party that was The World Restaurant Awards—which took place in Paris on February 18—in walked Virgilio Martínez, the Peruvian star chef behind Ichu Peru in H Queen’s and Central in Lima. He was swiftly followed by Mauro Colagreco from Mirazur on the Côte d’Azur and Kyle Connaughton from SingleThread in Sonoma— both recently awarded a third Michelin star for their respective restaurants—who melted into the throng knocking back cocktails. If the parade of superstar chefs with multiple awards sounds predictable, then The World Restaurant Awards (WRA) in Paris turned that idea—at least partly—on its head. The latest in a line of global culinary extravaganzas seeking to mark a departure from Michelin and the 50 Best Restaurants series, WRA has set the tone by claiming to champion restaurants, chefs, cuisine and organisations otherwise at risk of being overlooked. It largely made for a compelling narrative, and served as a reminder that the world of food is far broader than tweezers and sous-vide machines. The key question, of course, is whether this new wave of culinary togetherness can be sustained in the longer term as the event grows, commercial imperatives intervene and it loses its initial shine as the new kid on the culinary block. The night’s biggest prize, Restaurant of the Year, was won by Wolfgat, a tiny 20-seat restaurant in a remote fishing village two hours’ drive from Cape Town. Its victory neatly supported the awards’ mission to celebrate unsung places and people. The winner was so unsung, in fact, that many I spoke to in the room hadn’t heard of it, let alone eaten there. Cynics could suggest that Wolfgat perfectly ticked all the boxes: it’s a restaurant in a country otherwise unheralded by global dining awards. Their cuisine represents the definition of hyper-local and seasonal. It boasts a majority female kitchen team—albeit with a male founder, chef Kobus van der Merwe, who accepted the award on the night. No one could begrudge him his moment in the sun, especially as a timely reminder of how food in Africa has indeed historically been so overlooked elsewhere. Room was made for the two titans of the culinary world—the two Alains, Ducasse and Passard—to both win awards, albeit in tongue-in-cheek categories. It couldn’t help but feel like a deliberate endorsement from the establishment. 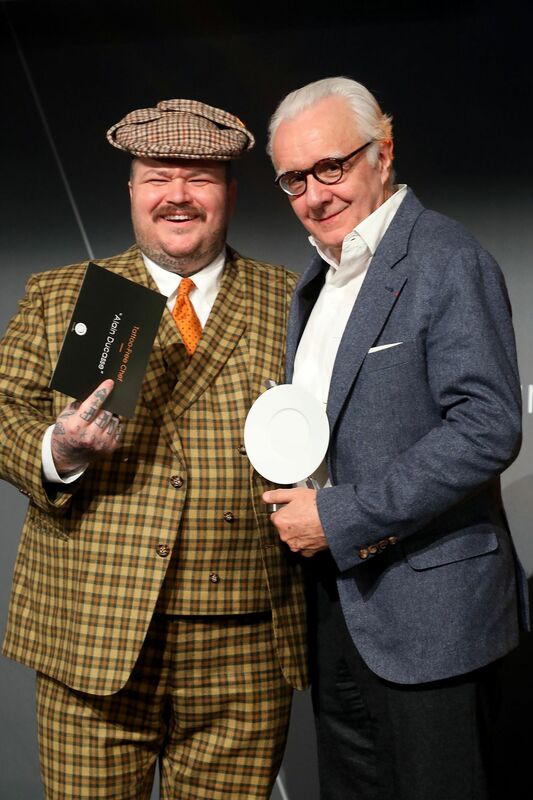 Ducasse won ‘Tattoo-Free Chef of the Year’ and collected it from Canadian chef and social media star Matty Matheson, famed for his tattoos. When I asked him what tattoo he’d get if he ever changed his mind and had one, Ducasse responded: ‘A cocoa bean’ – a shrewd answer from someone with a rapidly-growing chocolate business. To the apt sound of Pictures of You by The Cure, the Instagram Account of the Year award was given to Passard (@alain_passard), beating out Margaret Lam (@little_meg_siu_meg) from Hong Kong and Matty Matheson (@mattymatheson) with his half a million followers. In fact, it wasn’t a great night for Hong Kong and China overall. Godenya in Sheung Wan lost out to Mugaritz in San Sebastian in the ‘Forward Drinking’ category—and, embarrassingly, only after the wrong envelope was opened and the wrong winner read out. Asia did, however, fare better elsewhere and took home the first two awards of the night. Inua from Japan—admittedly a Scandinavian restaurant helmed by Noma’s former head of research, Thomas Frebel—won ‘Arrival of the Year’, before Bangkok’s BoLan won the ‘Tweezer-Free Kitchen of the Year’ in an homage to real cooking techniques. The different feel overall of the evening meant that tuxedos and other traditional vestiges of awards ceremonies were noticeable by their absence, while even the voiceover featured the soft dulcet tones of northern England. The awards were decided by a total of 100 judges from 37 countries, a list of stellar names including Massimo Bottura, David Chang, René Redzepi, Ana Roš, Yotam Ottolenghi and Clare Smyth, as well as Hong Kong chef and restaurateur May Chow of Little Bao. "I thought tonight was a start of something amazing. The awards was well curated and it showcased the F&B industry as a whole. I’m so happy that a restaurant like Wolfgat won best restaurant of the year. It shows how many absolutely amazing restaurants and food experiences that are missed. It really reminds us what’s important to us in F&B: celebrating journalism, food humanitarian efforts, restaurants, dining and drinking experiences, classics and new. I definitely think we’ve widened our food lens." One of the most warmly-received awards went to Darina Allen from Ballymaloe House in South West Ireland for the ‘trolley of the year’. From a family of true culinary pioneers, she dedicated the award to her mother who died last year but started the elegant Georgian house’s famed dessert trolley way back in 1960.In its way, it said much about the attempted mission of The World Restaurant Awards. Ballymaloe would never win a Michelin star or make it to the 50 Best list, but they were celebrating and championing things like sustainable, seasonal farm-to-table cooking more than half a century ago. Another positive came in the recognition for the Refugee Food Festival, an annual event that sees restaurateurs open their kitchens to refugee chefs. Giving a global platform to these kind of places and initiatives can only be a good thing. But the real challenge for The World Restaurant Awards remains—namely, to go beyond headline-grabbing awards categories and build on the launch with integrity, true diversity and total transparency.